Born in Germany, where his first name would have been pronounced “Lu-ees,” Civil War veteran, surveyor and coal mine engineer Louis Nawatny founded Louisville, Colorado in 1878. Before coming to Colorado, Nawatny, worked for the Davenport & Saint Paul Railroad in Iowa. In Colorado, Nawatny worked for Colorado Central Railroad, which later became the Colorado & Southern Railroad. The railroad established the Welch coal mine, named for railroad tycoon C.C. Welch, in 1877. The Welch Mine, adjacent to what would later become Louisville, provided coal for the railroad and was later sold to the Union Pacific Railroad. Nawatny platted 66 lots along Front Street and Second Street (now Main Street). By 1891, all 66 lots were sold, 47 to men and 19 to women. 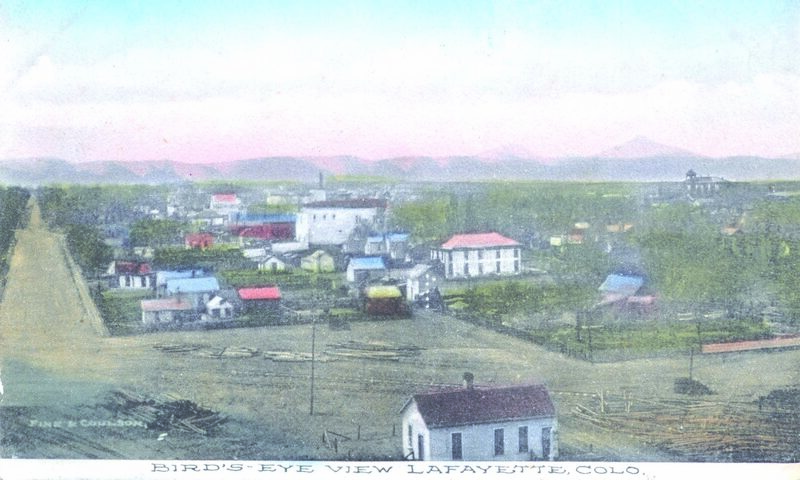 Future Lafayette residents Walter W. Moon and John H. Simpson both purchased Louisville lots from Nawatny. Starting in 1878, property seller (grantor) and town founder Louis Nawatny’s name was recorded on property deeds as “Louis Nawatny.” After January 1880, his name was recorded as “Louie Nawatny” and a February 1881 deed has Nawatny’s name listed as “Louis,” “Louie” and “Lewis.” By November 1881, all Nawatny deeds return to the “Louis” spelling. Deeds on file at the Boulder County Clerk and Recorder’s office show that, starting in January 1880, transcribers under the employment of county clerk Junius Berkley (who married Lafayette Miller’s sister, Alfaretta, in 1879) used “Louis Nawatny” when describing the property in the body text of the recorded deeds, but then signed Nawatny’s name as “Louie” on the signature line. Before the age of typewriters and copiers, government transcribers recording official documents often signed — in their own handwriting — the name of the grantor. 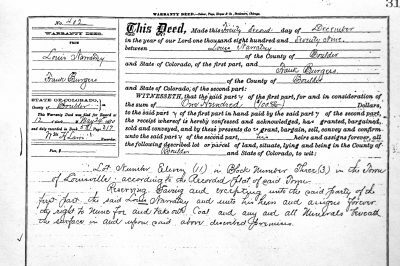 1880 Boulder County property deed showing “IS” underlined in Louis Nawatny’s name. Sources: The Daily Gazette, Davenport, Iowa, Aug. 24, 1870.